The curtain went up last night to an almost full house and to quote one of our happy audience members who contacted us via the website straight after the show "What a fantastic show! Well done to everyone. We loved it." Be sure you dont miss out, Saturday evening is already SOLD OUT. Get your tickets via this site for Wednesday, Thursday and Friday, still some left, but be quick! The bidding ending on the eBay auction of the VIP deal for a pair of tickets, meal at Blend, back stage tour and many other extras at a very respectable £52.20. We were surprised to learn the winner was Michael Stockbridge, from Kent! Michael and his wife will travel down by train and stay overnight in Bristol, just to see the show. Never having even been to Bristol before, they are just very big Jesus Christ Superstar fans, 70 shows big! They are eager to see what TMTG will do with it and we are sure we will not disappoint them. Not long to go now to the show and tickets are disappearing fast. Rehearsals have been going really well and are getting better and better. Confidence is sky high that this will be a cracking show not to be missed. There are still some bargain 3 for the price of two tickets available for the first night. The show is at the Armstrong Hall, Thornbury from Tues 18th to Sat 22nd Oct with performances at 7:30 pm each night except Saturday which starts at 6:00 pm. Tickets are normally £10 with concessions at £8.50. For the box office call Karen on 01454 853947. 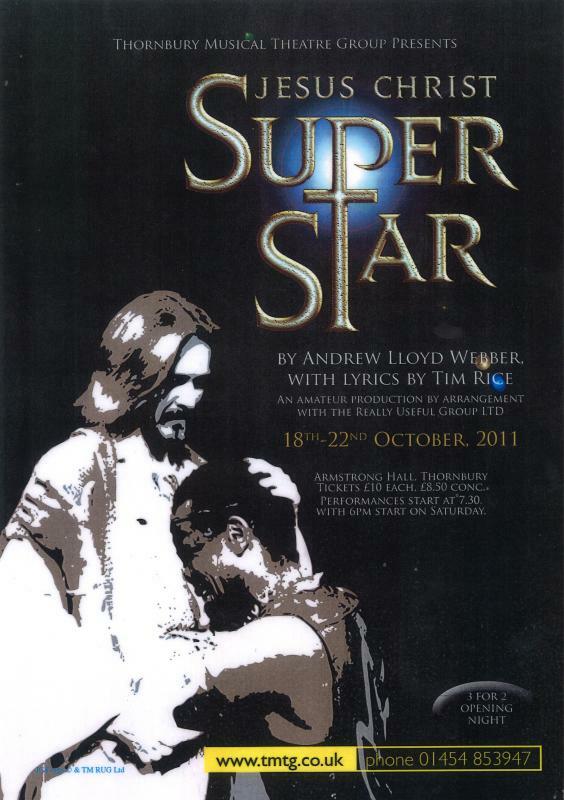 You may have already heard that to mark the launch of the sale of tickets for Jesus Christ Superstar, TMTG has assembled a very special VIP hospitality package for two people that it will sell by auction on eBay. The VIP package can be taken by arrangement on either the Wednesday, Thursday or Friday performance. The package will be put on eBay starting at just 99p on 15th September and will be sold to the highest bidder after a 10 day auction period. Interested in this auction? For more information on what is included in the auction and to even place a bid yourself, click here. The music has been learned, the choreography is well under way and the all-important blocking has begun. There is a buzz of excitement in the rehearsal rooms and all departments are gearing up and looking forward to opening night at the Armstrong Hall, Thornbury on Tuesday 18th October at 19:30. Productions will run until Saturday 22nd October. They will start at 19:30 from Tuesday to Friday, then 18:00 on Saturday. This is a show not to be missed, so reserve your tickets online shortly or ring Karen on 01454 853947. The first vocal test, Everythings Alright was passed in fine style, boding well for the bigger test to come with I Dont Know How to Love Him. This again was sung with the confidence of someone who was not afraid of the musical challenge or the responsibility that went with the Hit number. The reaction to the crowd baying with great enthusiasm for Jesus to be crucified was particularly good. Taken overall however the build up to the inevitability of your painful death was portrayed with sincerity and complete belief, leading to a fitting end to this thoughtful portrayal.